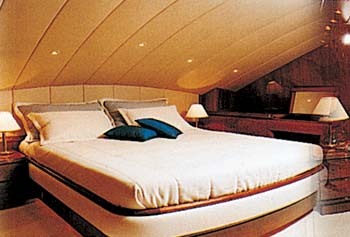 On board PEGASUS, the state of the art technoogy is uniquely complimented by refined classic style, resulting in an exhilerating combination of luxury, comfort and peak performance. 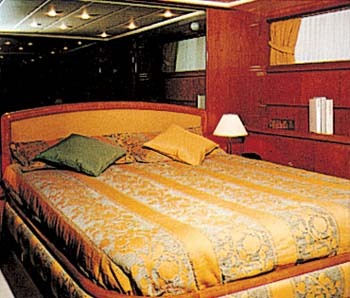 PEGASUS offers accommodation for ten guests in two master, one VIP and two double cabins, all with their own ensuite facilities. On the main deck and adjacent to an elegant dining area fit for gourmet meals, the salon is comfortably dressed in fine leather and wood, creating the right environment for relaxation, conversation and entertainment. 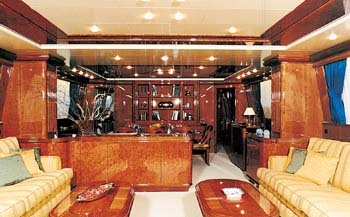 Needless to say that it is fully air-conditioned and uses the latest in engineering, navigation and communication. ACCOMMODATION : Ten guests in two master, one VIP and two double cabins, all with en suite facilities, day WC on the main deck. 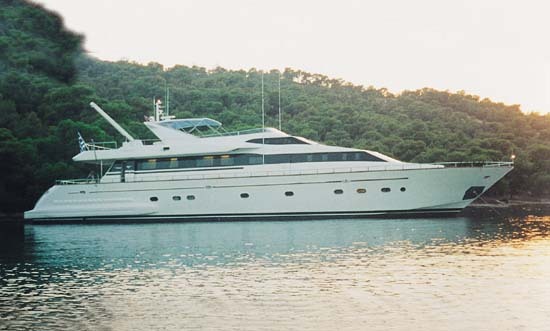 EQUIPMENT : Radar, Plotter, VHF, GPS, Auto pilot, Navtex, Cellular phone, Sat com, Bowthruster. RECREATION : Audio & Video entertainment in Salon and Master cabins, audio in rest of cabins, RIB inflatable 4.30m with Yamaha 60 HP outboard, jetski, waterskiing, kneeboard, tubes, banana, windsurf, smorkeling, fishing, canoe, jacuzzi.